One of the novelty and amusing releases from Carlton Ware in their 'Walking Ware' series. This one is the 'Large Teapot ' . Designed by Roger Michell (Lustre Pottery) for Carlton Ware , this particular piece was manufactured by Carlton and Price Kensington. It is slightly lrger body than the other teapots in the series with less curve on the spout. Similarly, the lid is slightly taller than the small teapot lid and is rather similar to the seated sugar bowl lid (also currently available on this site). The Pot is plain white with black shoes and blue striped socks. The finial is broader and it has a flange. The item is backstamped beneath the feet and is undated. 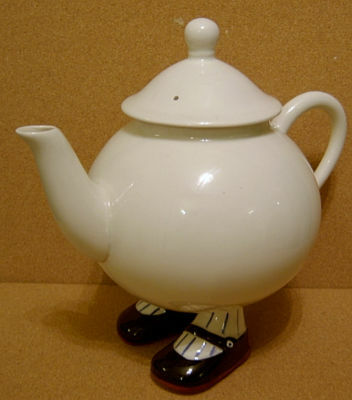 The overall height of the Teapot to the top of the finial is approx 8.5 inches (22 cms).